Monday morning as Brett gathered his things to head back to Chesapeake and work, I woke to realize that I didn’t have anything on the books for the next two days. No appointments, no guests, nothing. Then the thought of our coming October hit me. Wow, we are going to be really busy! So one thought lead to another and I decided it was time to grab these two days and relax. Summer has been really busy and a day here and there just really didn’t give me time to relax my brain. So two days would fit perfect. As I dressed, one thought kept racing through my head … where should I go? Of course I love taken off with no place in mind. I like to call them my “little adventures”. General I have a point to travel towards and make up the rest as I go. But for some reason, I couldn’t come up with the point to drive towards. It wasn’t until just as I finished dressing that the place come into focus. Okay, I know that isn’t somewhere most people would jump at the chance to go. I mean when you think about all the places I have traveled to over the last three years, this isn’t normal for me. But we have been doing a lot of talking about the Civil War lately. 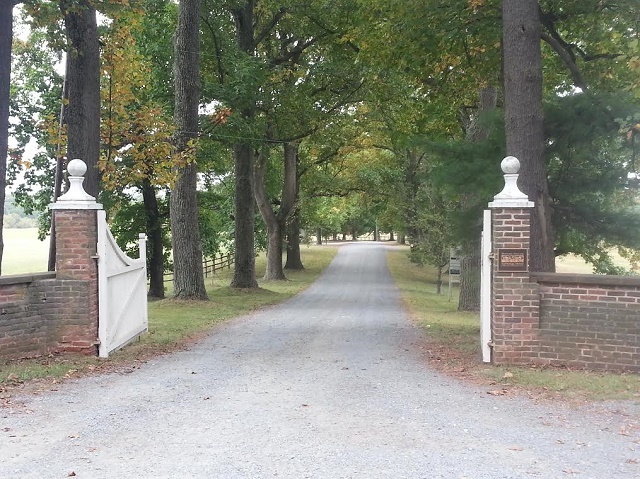 We have been working with someone to put together a great Civil War Weekend here at Belle Grove in April, 2015. 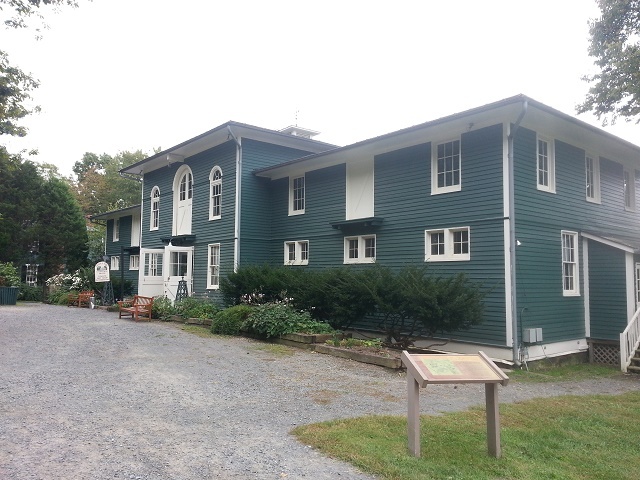 With the 150th anniversary of the death of John Wilkes Booth coming year and Garrett’s farm’s location just four miles away, we want to make this a huge event. Plus Brett and I have been talking about our 30th Wedding Anniversary in October, 2015. 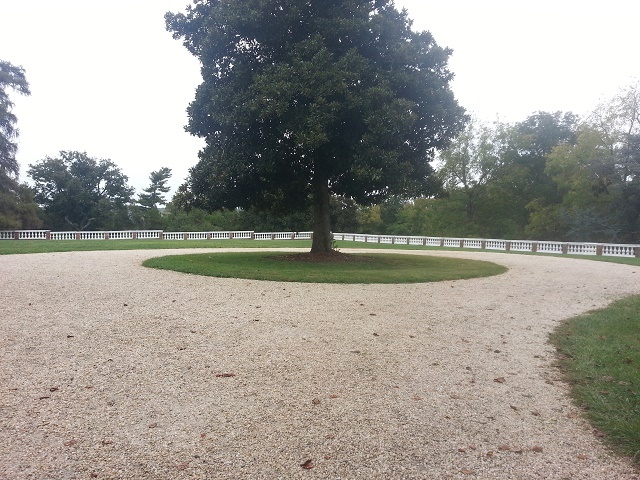 I want to renew our vows here at Belle Grove. One because I want to get married here and second because I want to do it special. I want to have our ceremony as a Civil War Reenactment. But that is another story. So I called Brett and told him that I was going to take two days off. That I was going to head to Antietam and that I was packing an overnight bag. Now Brett has learned not to question why. I love him for that. And we both have learned that when an idea like this comes, generally there is a reason for us to go. We end up meeting someone or finding something or seeing something that leads to our next step in this awesome journey. So he told me to have a good time and be careful. I told him that I loved him and wish he was with me. 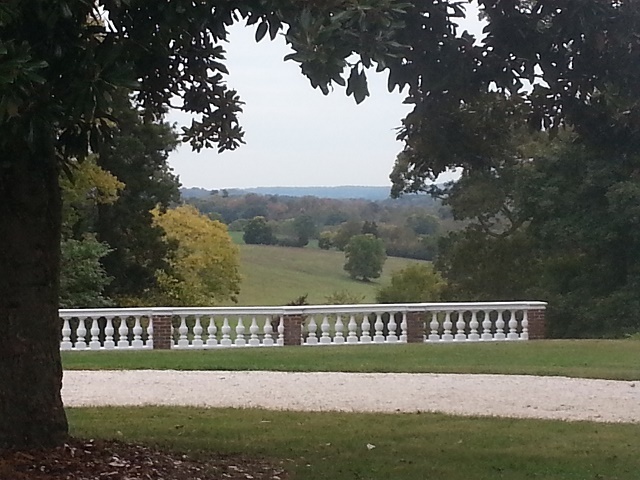 I closed up Belle Grove and grabbed my bag and headed out for the day. Just three steps out the door, I stopped. Not because I changed my mind, but as I had been heading out the door, I realized that I would be heading northwest and there would be a chance I could come close to the Inn at Little Washington. For you that don’t know, I love Chef Patrick O’Connell and the Inn at Little Washington. I haven’t stayed there… yet. But I have both of his cookbooks and love his story of how it came to be. I have used his recipes, changing them to make them more my own, and followed his example in how to get started right. 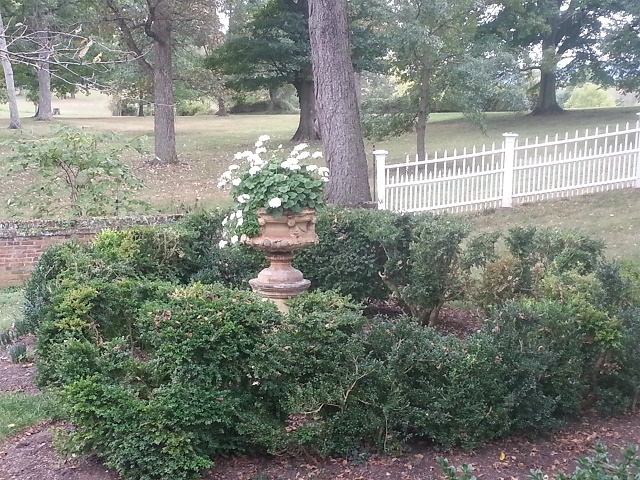 I always say I would like Belle Grove to be like the Inn at Little Washington, but in our own way. So I unlocked the doors and grabbed my two cookbooks. You never know I might get a chance to meet him and I wanted to be ready. As I closed the car door, I posted our announcement that I was off and the game of “Where in the World is Michelle” was beginning. I love playing this game. It is so much fun to see others guessing the locations and getting into the journey as much as I do. While I am generally alone of these trips, it almost seems that everyone is with me. And because of this thought, I look at things a little differently as I go. I always think about taking more photos because I want you to experience it with me. I got back to the castle and pulled over to take a shot of the front. It was really cool! It looks to be a brick structure with the corners made of stone towers. The front looks to have a bridge and moat. The front entry of the drive, just as you come in, there is a gruesome gargoyle entreating you to turn back while you can. As I made my way back to the driver side of my car, I saw a young man walk out towards the mailbox. 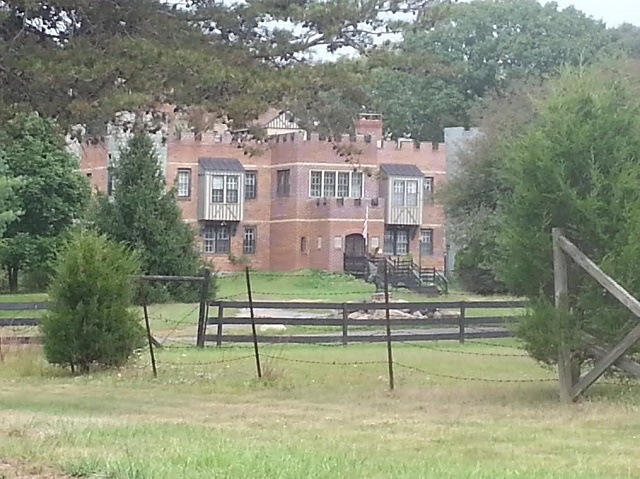 Yes, even castles have mailboxes in Virginia. So I pulled up and asked if he knew the story of the castle. He told me no. 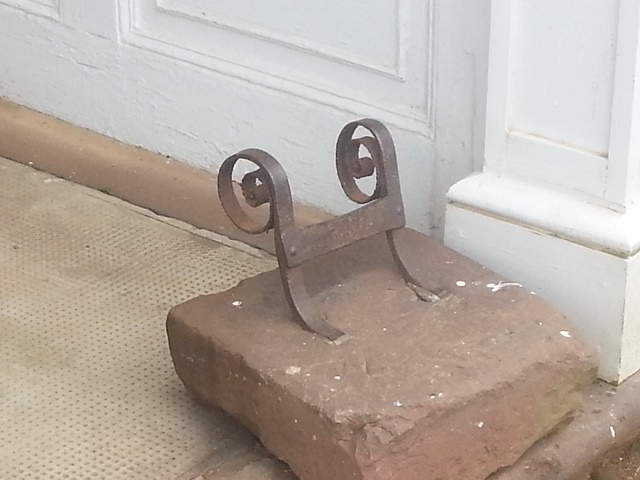 He had just moved in to help care for the castle and grounds. I asked if anyone lived in it. He said yes, but he didn’t know them or their story. So I thanked him and continued on my way. The next thing that caught my eye was a sign that said, “Mansion Tours” and then the main sign that said, “Oatlands, Historic Home and Gardens”. As I passed I quickly started running through my schedule and how much time I had until I got to Antietam. Then it hit me…. Schedule? What schedule? So I turned around and headed back. The lane was beautiful. So clean and clear. Our entry lane tends to be a little crowded and a makes for trouble in mowing. But here they had room between these mature trees to get two mowers around. 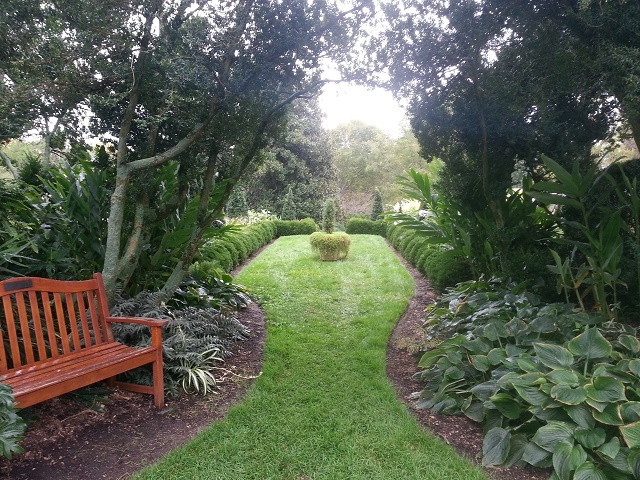 Since I have been cutting the grass this year (Brett does it too), I was very envious of the space. Behind the trees stands a wonderful fence line and fields just beyond. 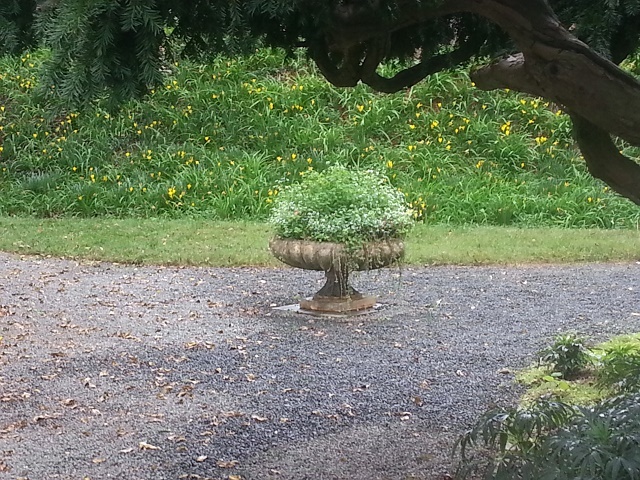 It is what you would expect as you come down a historic home property. I think we need a fence line too now. As I headed into the parking area, I caught site of a green building. My first thought was, “Is this Oatlands”. Somehow I was expecting a little more for a “mansion”. 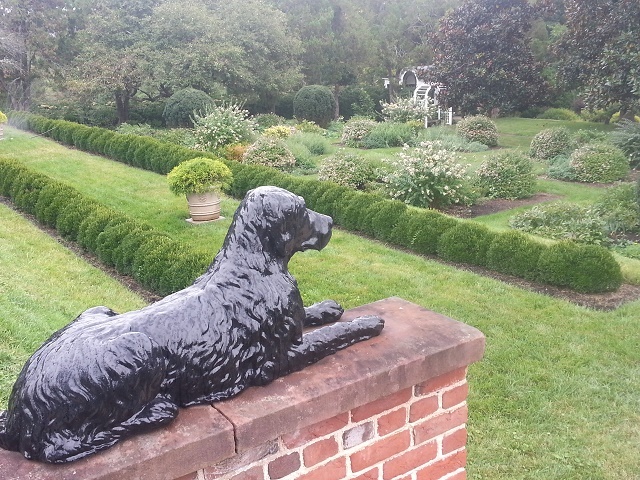 I got this same feeling when I went last year to see Gunston Hall, home of George Mason. Someone had sold me on the idea of changing my travel that time to go see it. 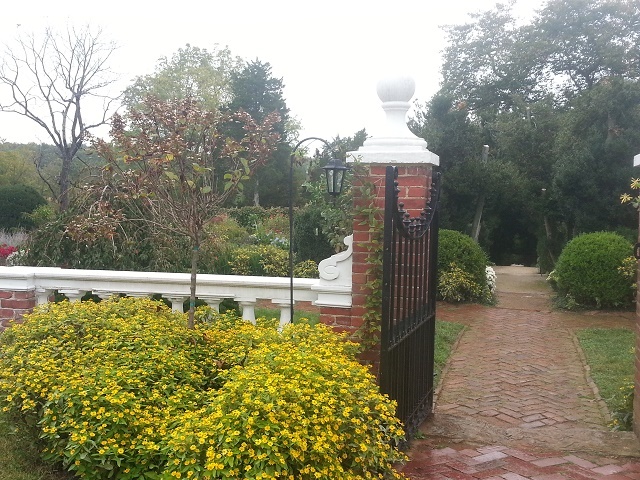 As I walked down the lane leading to Gunston Hall, my thoughts were, “I paid this much to see a little Cape Cod style Colonial? 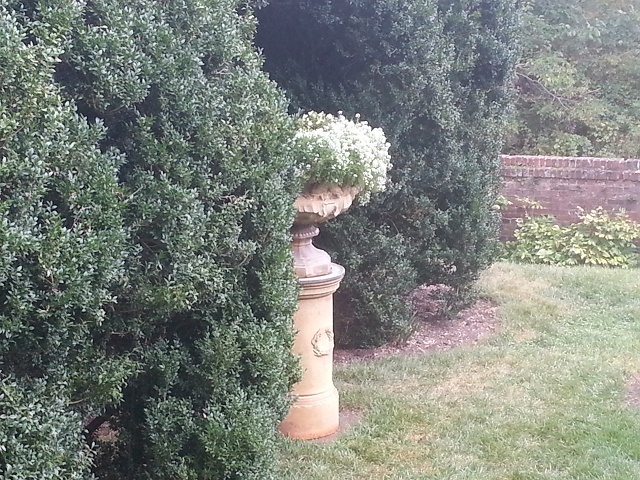 Really?” Of course I was very much mistaken about Gunston Hall, as I would be about Oatlands. Most of my conversation was with Tansy. When I told them I was from Belle Grove Plantation, their first thoughts went to Belle Grove Plantation in Middletown/Cedar Creek. I let them know that it was a common mistake since both had James Madison connections. I shared pictures and of course one of the first questions was about our ghosts. It’s Halloween and it’s on everyone’s mind right now. We talked about our events in October and discussed their event for their ghost walk too. 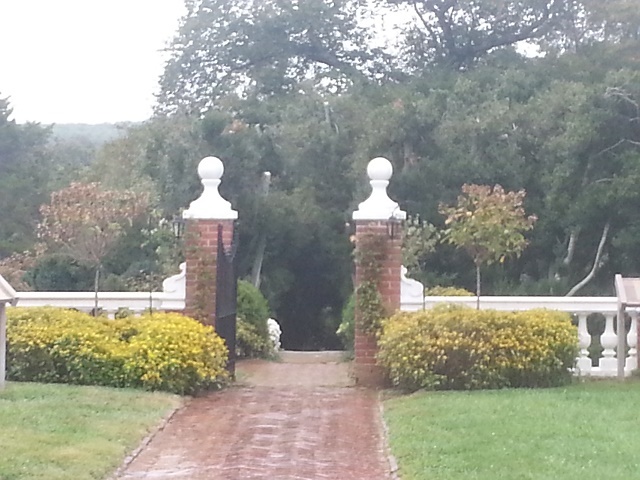 So off I went with my umbrella and camera ready to see the mansion. As I walked down the path, I could see a yellow home in the short distance. This must be the mansion. It was from the side so I still didn’t know what was in store for me. As I walked down the path, a tree caught my eye. It looked old and twisted and I loved it! 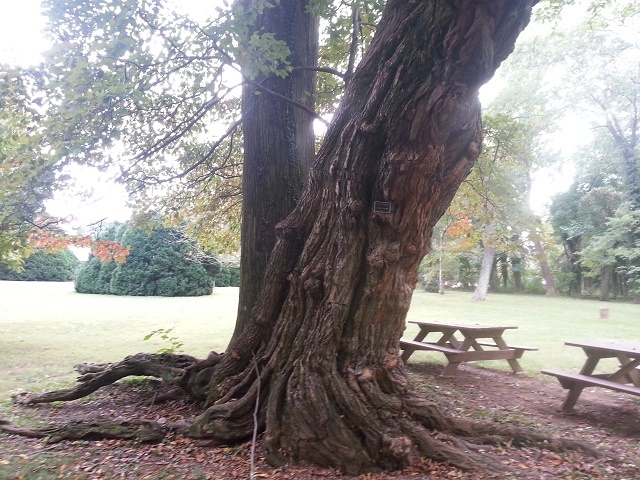 I love odd trees and old trees. So I grabbed a shot of it and saw there was a sign on it. It turned out to be an Osage Orange Tree! I had never seen one. We had Osage Oranges in our window decorations last Christmas, but someone had brought them to me. And this tree was really showing its age. Just beautiful. The first small building I came across was the Bachelor’s Quarters. The building wasn’t open to view, but was built in 1820. Brett and I had seen several Bachelor’s Quarters or what they called Garconniere in New Orleans when we toured the historic plantations there for our research for Belle Grove. I had not seen too many of them here in Virginia. The second building I came across was the Greenhouse. 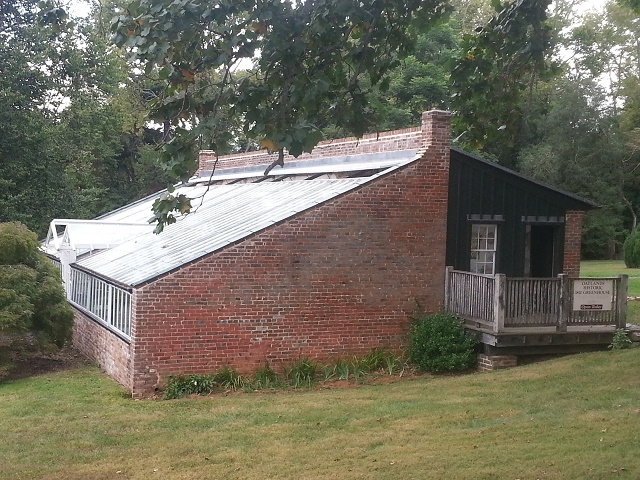 This Greenhouse was built in 1810 and is the oldest Greenhouse in Virginia. 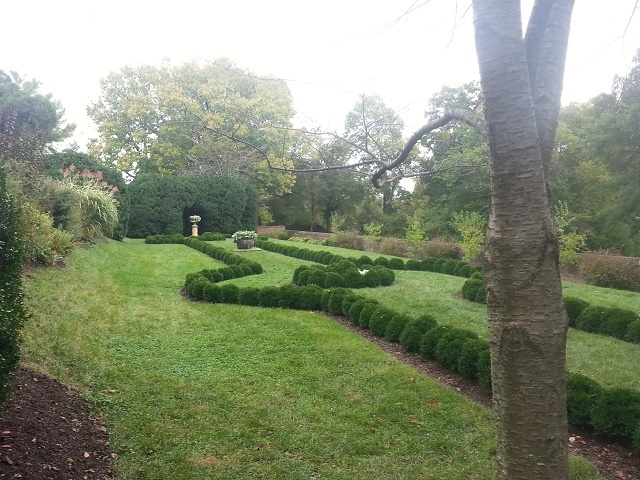 I didn’t take the time to go in because I wanted to see the Formal Gardens. Then I turned around and there she was. 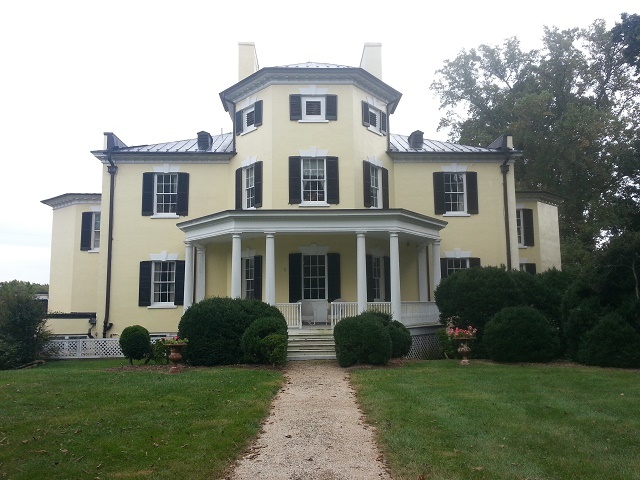 Oatlands Mansion. Needless to say I was very happy I turned around! It was breath-taking! 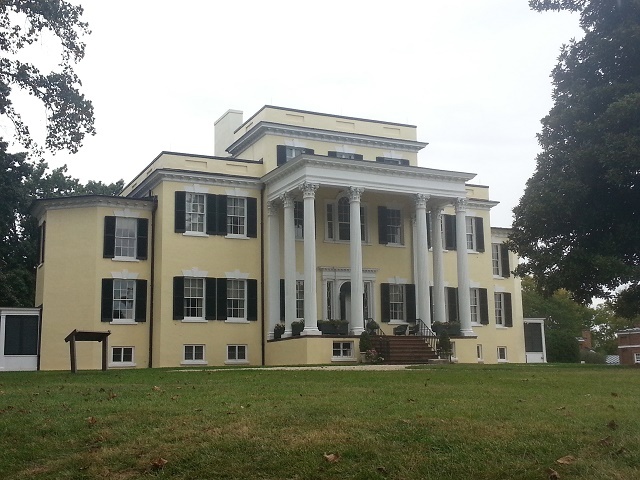 Now I love Belle Grove and its grand mansion, but really, this mansion was something else! 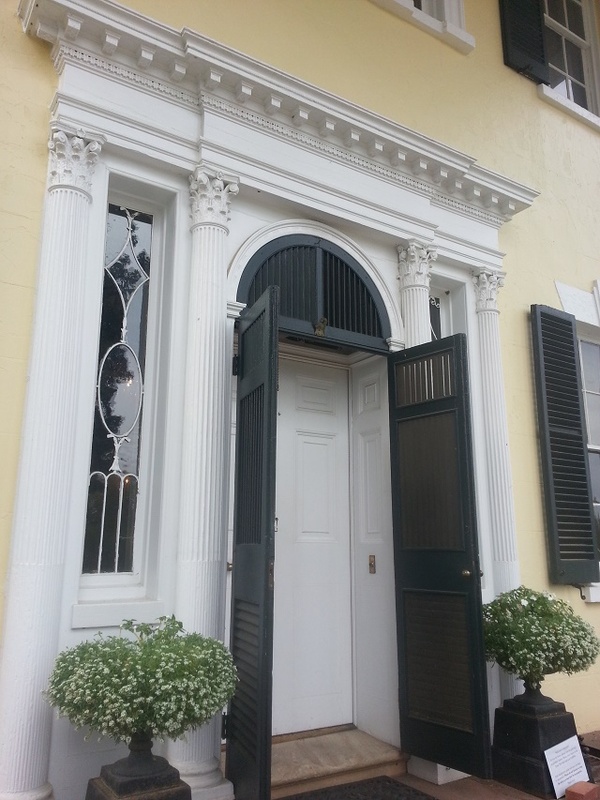 The columns on the portico alone were worth staring at for an hour! They have a Boot Scrape like we do! 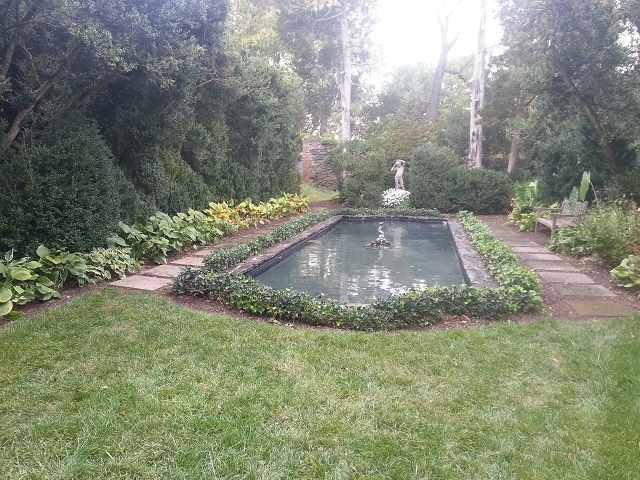 “The East-West Axis of the garden begins when exiting the east door of the mansion. • Towering above the east-west axis, American Boxwood (Buxus sempervirens `Arborescens’) provide shade as one descends the stone steps. 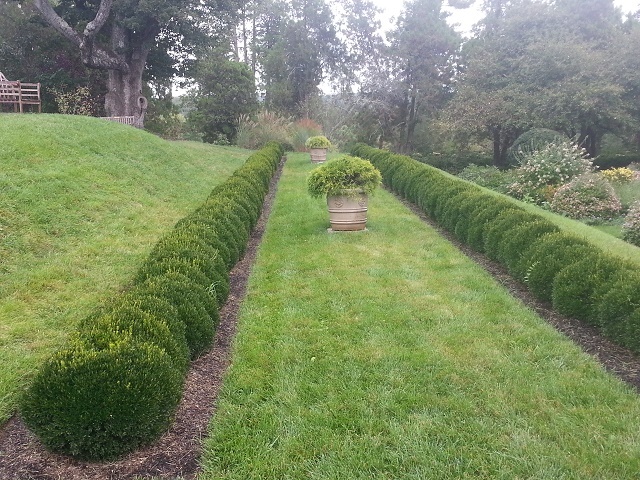 • English Boxwood (Buxus sempervirens `Suffruticosa’), along the north-south axis, remain but are experiencing decline. 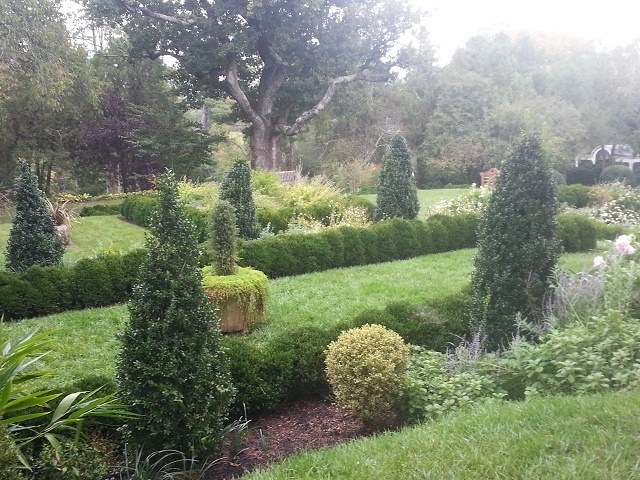 • Two large trees planted in Carter’s day still thrive: the European Larch (Larix decidua) welcomes all to the garden with soft descending branches at the garden gate and the English Oak (Quercus robur) stands majestic in the center of the garden. Then it came time for the tour. I was the only one on the tour, so the guide was able to spend a few more minutes with me. The interior was just as grand as the exterior. Sadly, I couldn’t take pictures. But the layout reminded me a little of the Confederate White House in Richmond. The guide was wonderful in pointing out architecture, people and items that might catch my interest. The one thing that really caught my eye was as you came. There are two portraits in the main hall and the young lady’s dress is what my eyes kept returning to. 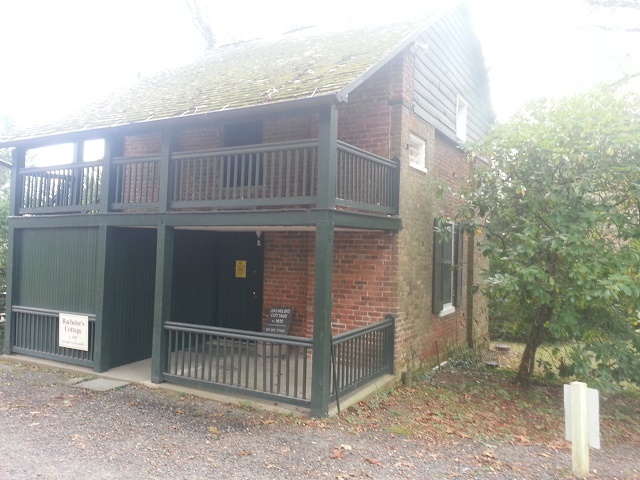 “George Carter began building Oatlands mansion in about 1804, having inherited the property on which it sits from his father in 1798. The house can be seen as George Carter’s personal interpretation of early 19th century architectural styles. Although no original architectural plans have been found, it is thought that Carter probably designed the house himself, possibly with help from builders and pattern books. Carter’s original plan was for a Federal or Adam style mansion consisting of a central block and symmetrical bays to the east and west. The house stood on a full basement and contained three main living floors and a small attic. A cupola topped the building. Construction continued for approximately 5 years. By 1808 the mansion probably had some rooms finished on the first floor, but was only framed in on the upper two floors and attic. Events leading up to the War of 1812, which brought on a financial recession and an embargo against trade with Britain, halted construction at Oatlands. After the end of the war, Carter – always the businessman – put his money and effort into building a mill complex on Goose Creek, the southern boundary of his property, rather than completing his mansion. When Carter again turned his attention to finishing the house, his vision for its appearance had changed. 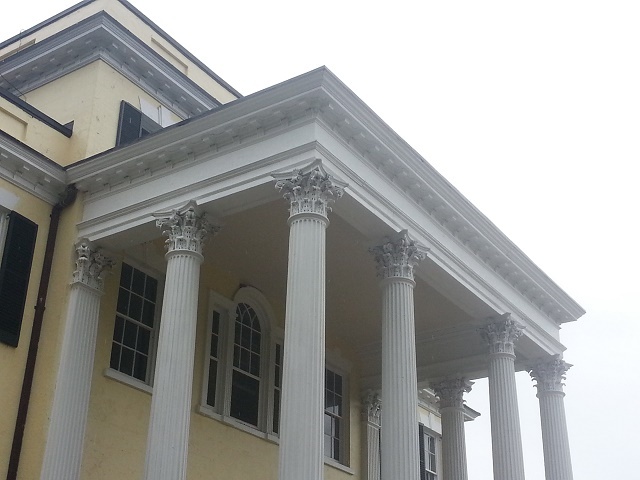 Greek Revival style swept the country in the 1820s, and George Carter was not immune to its pull. The red brick walls were covered in stucco and scored to resemble stone; half-octagonal staircases were added at either end; and a grand portico rose on the face of the mansion. Carter also added a parapet wall along the roofline at the front and sides of the house, thus emphasizing the linearity of Greek Revival style rather than the vertical focus of Federal architecture. Inside the house, Carter made one last change. By enclosing two corners of his drawing room, he created an octagon, a very popular shape throughout early 19th century architecture. 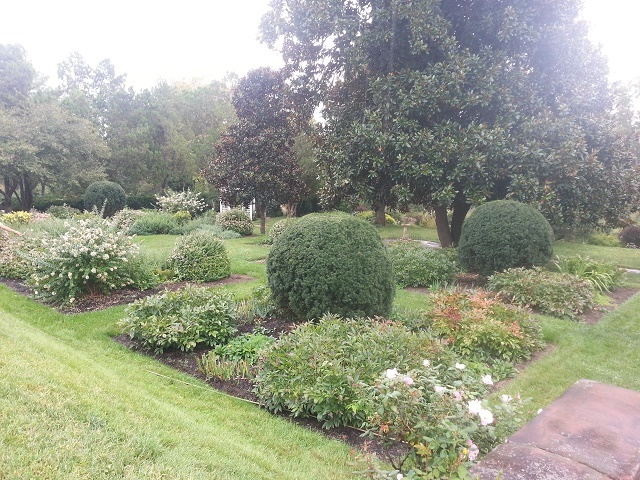 The 20th century owners of Oatlands, William and Edith Eustis, made hardly any structural changes to the mansion. Sensitive early preservationists, they retained George Carter’s floor plan and architectural features with only a few exceptions. A porch was added to the north face of the house, the second floor staircase was moved, and two small bedrooms on the second floor were joined to form one large room. As I finished up the tour and headed back to the Carriage House to return and thank them for the umbrella, I just had to take a deep breath and smile. What would I have missed if I had not turned around? Over the years, as we have traveled, there have been places we came across that we had wanted to stop but didn’t think we had the time to do. What have we missed over the years! There truly is something to “Stopping and smelling the roses”. Tomorrow – Part 2 of my first day.